This Thursday is a busy one in the realm of art openings, so choose wisely! We highly recommend checking out the enigmatic photographs of Eagle Hunters by Lyle Owerko, the immersive animation and the prints behind them at the International Print Center, and Two if By Sea, a group show featuring Johee “Stickymonger” Park at MINY Media Center. This weekend, head uptown to the Heath Gallery for a special exhibition of works by artists using repurposed materials (plus a new sculpture in Marcus Garvey Park) then downtown to check out artists influenced by technology at Guy Hepner Gallery. 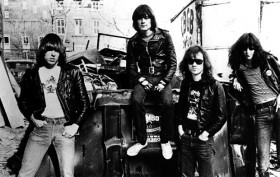 Sunday, have a bagel and some Jameson to toast John Reed’s new novel, then book it to Queens for the new exhibition celebrating the 40th anniversary of the Ramones. Cap off next week by educating your creative self with a grant writing workshop at Powerplnt.